Restaurant Review: Fine Food, Craft Beer, So Much Whiskey, Vegetables, Too! Tradesman’s Opens on Chestnut Street. Before you even walk inside Tradesman’s on Chestnut Street, you can understand the vibe it’s trying to achieve. With large garage-style windows that open from the main bar onto about a half dozen stools on the sidewalk, the industrial feel is evident from the street. The first floor is large and spacious, with high ceilings planked with reclaimed wood, varied industrial light fixtures, and raw edge wooden tables in the bar area. In the back are plenty of tables for seated dining, including a large round booth right behind the hostess stand. Along one wall are open shelves with a trove of vintage cameras, clocks, and other pieces that look like they would feel right at home in a hip loft apartment. The upstairs is smaller, with a sprinkling of tables that overlook the expansive first floor, and a small and modestly stocked bar that can handle some of the overflow from downstairs. In the far back is a private room with a long, rustic table that looks out onto Drury Street and McGillin’s Olde Ale House, Philly’s oldest tavern. It’s a fitting view from a restaurant that’s been molded out of a century old building that was once a bank. The vaulted ceilings give the space a lot of life, combining multicolored lighting with much of the molding’s original, intricate details. Original details are highlighted by modern lighting accents. Photo from Tradesman’s Facebook page. Tradesman’s boasts an impressive number of taps at the main bar on its first floor. The most interesting are two spigots attached to wide metal pipes with viewing panes. These are where their house infusion come from. Currently, they are sporting two unique flavors: s’mores ingredients infused with 2SP’s Delco Lager and chilis and mangoes infused with Yards Philadelphia Pale Ale. While the infused brews take some extra time to pour, they are well worth the wait. The infused Delco Lager is like a pint glass of dessert and the spicy/sweet combination gives the PPA a nice bite with a smooth finish. Excerpt from Tradesman’s Draft Menu. For those interested in whiskey, Tradesman’s offers an interesting lineup focused primarily on American bourbon and rye. It’s worth taking the opportunity to enjoy some local flavor by checking out New Liberty Distillery’s Kinsey Rye Whiskey or Manatawny Still Works’ Keystone Whiskey. If those don’t strike your fancy, you’ll have dozens of others to choose from. Tradesman’s currently boasts a whiskey list with 80 different options and they are hoping to expand that to include 120 choices. The food at Tradesman’s boasts a lot of classic barbecue favorites including brisket, ribs, macaroni and cheese, pork belly, collard greens, cornbread, and more. The mac and the ribs are especially good; Tradesman’s offers a plethora of sauce choices, but it’s worth trying the ribs dry to fully appreciate the house made rub that’s been used. (The same rub appears on the rims of a couple of cocktails as well, so keep an eye out for that.) For those who are interested in vegetarian fare, there’s more than you might usually expect, including zingy carrot hummus, mushroom toast, and a delicious Jersey tomato salad. Tradesman’s dry rub makes for mouthwatering BBQ. Photo from Tradesman’s Facebook page. If you venture down below the first floor to use one of the four unisex bathrooms down there, you’ll sneak a peak of what lies beneath Tradesman’s: another level that extends underneath BRU (also owned and operated by Teddy Sourias’ Craft Concepts Group) next door and is currently being renovated, with the hope that it will open fully in 2019. The space includes the original vaults from Tradesman’s National Bank, so it will be interesting to see how those are incorporated into the final design. 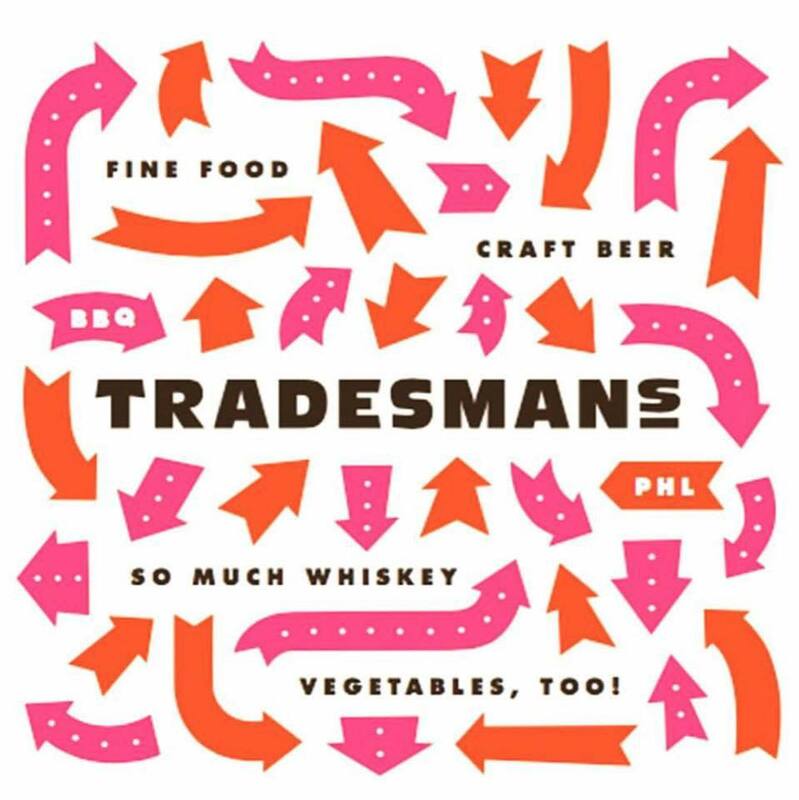 Tradesman’s opens at 1322 Chestnut Street on Thursday, August 9th.